Sunscald may appear on foliage and fruits. The disorder is caused when the temperature of the fruit exceeds 40°C. An imbalance of various chemicals takes place which causes the destruction of the tissue. Heat injury expresses itself through a narrowing of the base of the stem, at the soil line. However, with protected environments these extreme temperatures hardly occur. Although I have been in many single tunnels where the temperature has reached 50°C due to bad ventilation or tunnel orientation. One can imagine that the narrow stem will reduce the amount of water that can pass, which affects the plant as a whole. It is not a very well known fact but seedlings are also susceptible to sunscald. The climate of a nursery is usually humid compared to the main growing tunnels. So one can image the sudden change will dry out the poor seedling within a day. Sunscald also occurs after cloud weather followed by bright sunny hot days. make sure increase the humidity through manipulation of the vents and irrigation system. It is also interesting to note that green tomato fruit heat up more quickly to a higher temperature than red fruit. So the risk of sunscald damage on green tomato fruit is much higher than red mature fruit. The exposed sunny side of the fruit tend to ripen more quickly resulting in uneven ripening. Pushed to the extreme, the sunny side of the fruit skin may become white and blister-like. 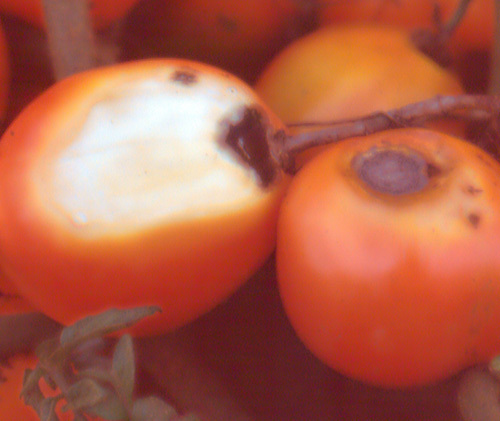 The tissue dries out and the typical sunscald white lesion is left, at this point the sunscald area is an ideal spot for fungi to penetrate the fruit. Increase nitrogen fertilization in order to increase leaf area which covers the fruits. Can be a problem with spindly plants. Cover the crop with shade cloth with densities higher than 20%. 30-40% is ideal in arid areas close the the equator. Increase the planting density. Does not always work, but is a solution. Soft, light-coloured areas develop on parts of the pepper fruits exposed to direct sunlight. These light areas shrink to a white, papery-textured area which can cover up to one third of the fruit. Sunscald is most severe in periods of high temperatures and where leaf cover has been lost because of disease or insect damage. Sun scald is not a problem where the grower has either shade cloth (at least 30% white or black) or plastic covering the crop. Fruit that are exposed directly to the sun during the green to mature green stage will develop this disorder. The texture of the fruit is leathery and firmer that the surrounding tissue. The area usually becomes lighter in colour and sunken. At an advanced stage the sunken area completely disintegrates and secondary infection takes place completely ruining the fruit.